A Day - what if? This week, Wednesday presented us with a snowstorm. Outside my windows, it appeared to be the middle of January - not April. Thick, wet snow covered everything. If you were driving, it was a mess. 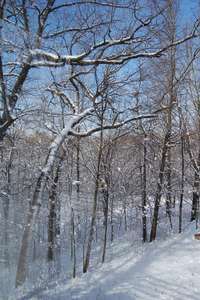 But if you love the clean, crisp look of glistening snow throughout nature, the storm was a treat. In the world of media, another storm visited us this week: the Storm of Imus. Calculating the number of words spent on this whirlwind would be impossible; I don't plan to add too much more. Nevertheless, the Imus incident raises some important issues. So, a few comments are in order. When I first heard the tape play, I felt a little sick. One can hear ugly speech easily with the communications available to us today. But, to hear these kinds of comments about college students is particularly gross. The announcement that Imus would be off the air for a couple of weeks surely seemed appropriate. Still, I couldn't help but wonder about how our society judges this sort of speech. Why the firestorm about Imus and his racist, sexist talk, when words like these appear on BET and MTV every day of the week? Why is our nation up in arms when a talk-show host who routinely has a potty, vulgar mouth uses nasty language - once again - yet "artists" making tens of millions of dollars spewing far worse language to teens rarely receives commentary? Please don't take my statements as indication that I wasn't bothered by Imus' comments. I was; they were bilge. What perplexes me, though, is why one old white guy insulting college girls dominates every aspect of our media for days . . . . And daily, constant, repeated sexist, misogynist, vulgar talk sexualizing young women gets little more than a yawn? I'd like the storm to cover more than one day - and more than one individual. Let's hope that more sunshine and fresh air comes to our discourse. It's about time.